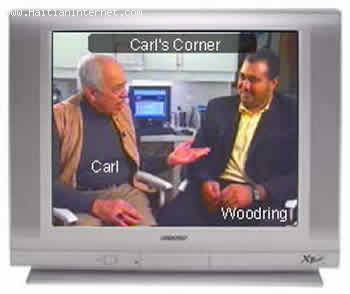 Did you catch the interview I had with Carl Fombrun on Island TV on December 23rd, 2004? If you saw it, watch it again... Tell all your friends to watch it too. If you missed it, you now have a golden opportunity to see it this time around. Since we are talking about Carl today, how many of you subscribe to Carl's Corner online? It's FREE, to sign up to his newsletter. "Le Coin De Carl Parlant et Ecrit De Tout et de Rien"
This interview would not be possible without the professionalism of Mr. Serge Olivier of Sights and Sound Pictures. Every time you watch Carl's Corner on TV, Serge is the man behind the camera. Serge is available for Concerts, Weddings, Birthdays, TV Productions, etc. Tune to IslandTV Tomorrow night (Thursday) and enjoy another round of "Le Coin De Carl with Woodring Saint Preux. Thank you Island TV for the Re-Run!